Click on the graphic to see a larger version (if you dare). WASHINGTON -- Is everything spinning out of control? The sense of helplessness is even reflected in this year's presidential election. Each contender offers a sense of order _ and hope. Republican John McCain promises an experienced hand in a frightening time. Democrat Barack Obama promises bright and shiny change, and his large crowds believe his exhortation, "Yes, we can." "It is pretty scary," said Charles Truxal, 64, a retired corporate manager in Rochester, Minn. "People are thinking things are going to get better, and they haven't been. And then you go hide in your basement because tornadoes are coming through. If you think about things, you have very little power to make it change." We gave the heads up here a few days ago that we were going to be launching this very special food and freebies sale. This morning, our buyers club members got the email that we were opening up the doors. I finally just caught up enough to put the word out here now. All of this is selling fast. We knew it would--great prices on emergency storage food, including on a great variety of Mountain House cans AND FREE PREP GEAR thrown in for good measure, such as NukAlerts and Maxpedition Merlin fold-up backpacks, and more. Unless things suddenly slow up, everything will be gone in days. So act now. PLUS Great Freebies Thrown In !!! FREE NukAlerts, Maxpedition Merlins, Bail-Out Bags, and Compact SW Radios! Summer is here! To celebrate, we are today kicking off our excessively extravagant (and my son/accountant tells me "foolish") Summer Food and Freebies Sale. 1. We have some of our famous 3-case/18-can Mountain House variety kits in hand and ready to ship. This represents the last large bulk MH order we placed right at the May 15 deadline when Mountain House stopped taking orders for cans until further notice. The next opportunity at MH cans will be in the fall (hopefully). Kit price for members on these is $439, shipping included to the lower 48! 2. We also have a couple of new Complementary food packages assembled for this sale. Package One includes a case of canned Yoders whole wheat flour, long grain white rice, and B&M bread. Package Two includes full cases of canned Red Feather butter and cheese. Both packages are $219 for our members, shipped to the lower 48. Plus ... you can add-on a one-gallon bucket of Wildflower Honey for just $49. 3. Those package prices with free shipping are great. But this is the crazy part. I am giving away a limited number of Nukalerts, Maxpedition Merlin folding backpacks, Bail-Out Bags, and compact shortwave radios with qualifying purchases. (One Freebie per customer.) Look around and see what these items are worth, and you'll see what my son means--"This is crazy!" 4. Navigate the Summer Food and FREEbies sale here, and don't delay. We'll be out of stock in just days. Imminent Food and Freebies Sale! As a courtesy, and to be as fair as possible, I am giving notice to our friends here of a very special sale that will be announced in the next few days. This pre-announcement is to be sure that those of you who are interested are pre-positioned to take advantage before the goods you want are gone. If you are not yet a member, it's a one-time $19 fee. That gets you at least 20% off everything in our store all the time AND FREE Shipping to the lower 48 as well. Simply join here today, and you will be added to our email list for first notice on the sale/giveaway details. 1. Member purchases of any emergency storage food at the standard 20% discount, or of one or more of the special food package offers below, qualify for the giveaways. 2. Giveaways will include NukAlerts or portable shortwave radios with long-wire roll-out antennas and carry pouch (with qualifying food purchases of at least $439), and Maxpedition Merlin folding backpacks or Maratac bail-out bags (with qualifying food purchases of at least $219). 3. We have put together at least three specially discounted, AFFORDABLE storage food packages with additional price breaks for this offer. The foods in these special packages will include another ever-popular Mountain House 3-#10 can case kit (we have the food on hand and ready to ship), Red Feather butter and cheese, B&M canned bread, white rice, whole wheat flour, and wildflower honey. 4. The freebies are available in limited quanitity as are the MH food kits. These are first-come, first-serve offers, while supplies last. One freebie per customer. The manufacturer needs to move product now. 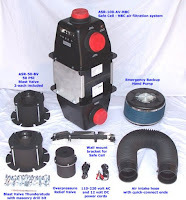 So we have a very unusual opportunity only through the end of this month to offer our buyers club members--30% off our list prices for any NBC Filter/Ventilation equipment we sell (and if you don't see an item you need listed, we can get it for you and get you the same 30% discount). Got a bunker, a basement room, or a room in your house you want to set up as a saferoom against airborne contaminants--to include chemical, biological, or radiological? Then this is your chance to get the system you can absolutely rely on. JUNE-ONLY 30% DISCOUNTED PRICE: $2870! Free shipping to the lower 48. Other filtration listings can be seen here. To get the June 30% discounts, members can simply make your purchase online or call us. We'll apply the 30% off for our club members before we charge your card. If you need to become a member--make the one-time $19 membership purchase, and you'll always get at least 20% off everything we sell! "The Unthinkable, Who Survives When Disaster Strikes - and Why"
Depends on your gender, your reaction time, and a little luck. A new book shows how you can up your odds. 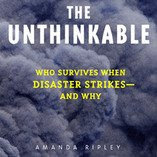 When Amanda Ripley set out to study the world’s deadliest catastrophes for her new book, The Unthinkable: Who Survives When Disaster Strikes — And Why, her family worried that she’d get depressed. After all, she’d be delving deep into the minds of people who endured tragedies ranging from the 9/11 attacks to the Asian tsunami. But in fact, says Ripley, a reporter for Time, “I actually found the whole thing encouraging. Once you talk to survivors and strip the mystery from a shocking event, you can see that the experience is never as frightening as you would imagine.” Time and again, she says, people reported a sense of dreamlike calm: “They said, ‘You know what? I thought I was going to die, but it wasn’t really scary.’” Here, the author shares other key insights. IN ANY UNEXPECTED CRISIS, THERE’S AN ODD SENSE OF LETHARGY. In other words, your brain is trying to sort out new and disturbing information, and it doesn’t act fast. “The most startling thing I learned about 9/11 was the slowness with which people moved,” says Ripley. “Many took the time to turn off their computers.” But you can fight off that stupor — simply by knowing to expect it. PEOPLE RARELY KNOW WHERE TO FIND AN EXIT — IN OFFICES, HOTELS, PLANES. “I always learn a couple of exits, so if I’m in a hotel and there’s a fire, I know where to go,” says Ripley. “Plane-crash survivors do the same thing.” She also suggests keeping a pair of sneakers at work — high heels slowed women down on 9/11. SOMETIMES IT HELPS TO BE A WOMAN IN A DISASTER. Women tend to fare better than men in events like hurricanes and floods. Why? “They’re more likely to evacuate when they’re advised to do so,” says Ripley. “Men tend to take more risks.” But to be fair to guys, she adds, research shows that men — especially blue-collar single men — are more likely to do heroic things, like risk their lives to save others. Cheers to that. 91% of Americans live in places with a moderate to high risk of natural disaster or terrorism. 65% of those who died in natural disasters from ‘85 to ‘99 came from undeveloped nations. 9% of heroic acts recorded from ‘89 to ‘93 were performed by women. GRIFFIN, Indiana: In a year when global harvests need to be excellent to ease the threat of pervasive food shortages, evidence is mounting that they will be average at best. Some farmers are starting to fear disaster. American corn and soybean farmers are suffering from too much rain, while Australian wheat farmers have been plagued by drought. "The planting has gotten off to a poor start," said Bill Nelson, a Wachovia grains analyst. "The anxiety level is increasing." Labels: Crystal ball, Cultural realities, Natural disaster preparedness, Why prepare? An Israeli deputy prime minister on Friday warned that Iran would face attack if it pursues what he said was its nuclear weapons programme. "If Iran continues its nuclear weapons programme, we will attack it," said Shaul Mofaz, who is also transportation minister. "Other options are disappearing. The sanctions are not effective. There will be no alternative but to attack Iran in order to stop the Iranian nuclear programme," Mofaz told the Yediot Aharonot daily. He stressed such an operation could only be conducted with US support. A former defence minister and armed forces chief of staff, Mofaz hopes to replace embattled Ehud Olmert as prime minister and at the helm of the Kadima party.